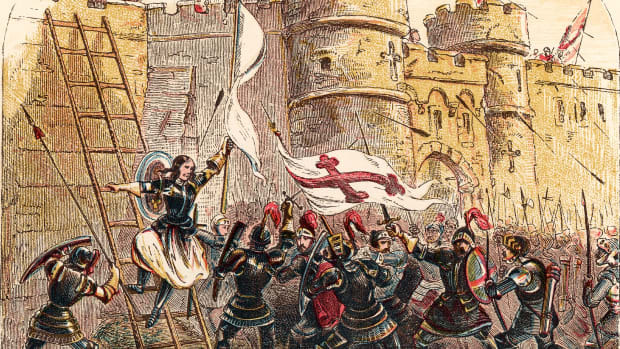 Joan of Arc, a peasant girl living in medieval France, believed that God had chosen her to lead France to victory in its long-running war with England. With no military training, Joan convinced the embattled crown prince Charles of Valois to allow her to lead a French army to the besieged city of Orléans, where it achieved a momentous victory over the English and their French allies, the Burgundians. 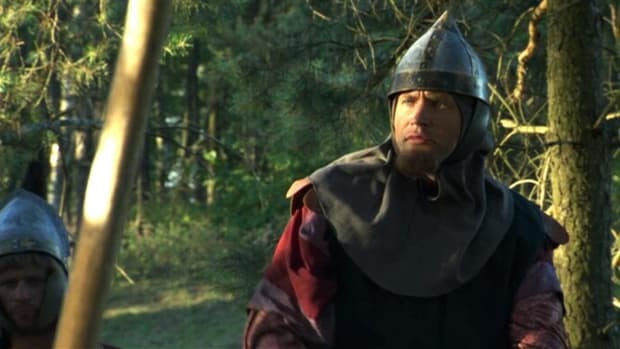 After seeing the prince crowned King Charles VII, Joan was captured by Anglo-Burgundian forces, tried for witchcraft and heresy and burned at the stake in 1431, at the age of 19. By the time she was officially canonized in 1920, the Maid of Orléans (as she was known) had long been considered one of history’s greatest saints, and an enduring symbol of French unity and nationalism. Born around 1412, Jeanne d’Arc (or in English, Joan of Arc) was the daughter of a tenant farmer, Jacques d’Arc, from the village of Domrémy, in northeastern France. She was not taught to read or write, but her pious mother instilled in her a deep love for the Catholic Church and its teachings. At the time, France had long been torn apart by a bitter conflict with England (later known as the Hundred Years’ War), in which England had gained the upper hand. A peace treaty in 1420 disinherited the French crown prince, Charles of Valois, amid accusations of his illegitimacy, and King Henry V was made ruler of both England and France. His son, Henry VI, succeeded him in 1422. Along with its French allies (led by Philip the Good, duke of Burgundy), England occupied much of northern France, and many in Joan’s village, Domrémy, were forced to abandon their homes under threat of invasion. Did you know? In a private audience at his castle at Chinon, Joan of Arc won the future Charles VII over by supposedly revealing information that only a messenger from God could know; the details of this conversation are unknown. 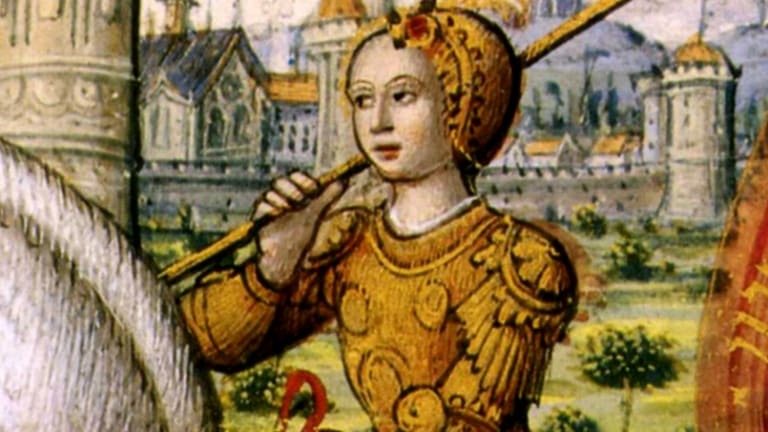 At the age of 13, Joan began to hear voices, which she determined had been sent by God to give her a mission of overwhelming importance: to save France by expelling its enemies, and to install Charles as its rightful king. As part of this divine mission, Joan took a vow of chastity. At the age of 16, after her father attempted to arrange a marriage for her, she successfully convinced a local court that she should not be forced to accept the match. In May 1428, Joan made her way Vaucouleurs, a nearby stronghold of those loyal to Charles. 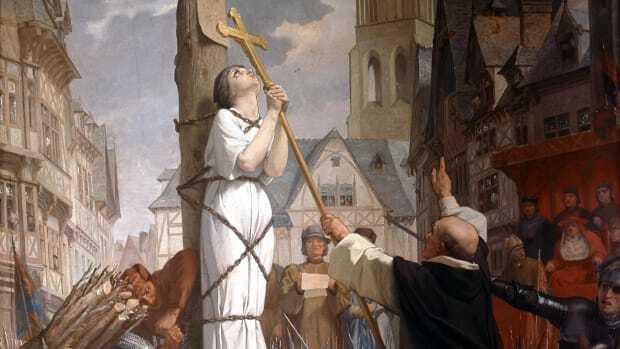 Initially rejected by the local magistrate, Robert de Baudricourt, she persisted, attracting a small band of followers who believed her claims to be the virgin who (according to a popular prophecy) was destined to save France. 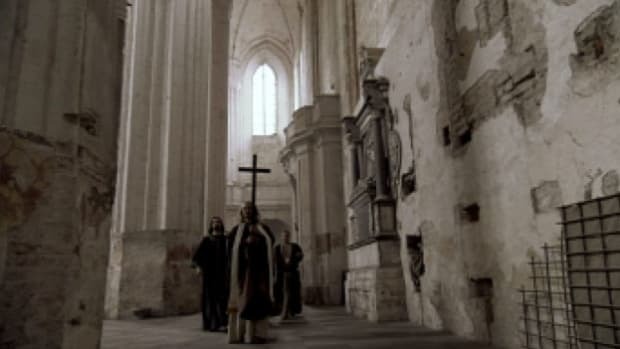 When Baudricort relented, Joan cropped her hair and dressed in men’s clothes to make the 11-day journey across enemy territory to Chinon, site of the crown prince’s palace. Joan promised Charles she would see him crowned king at Reims, the traditional site of French royal investiture, and asked him to give her an army to lead to Orléans, then under siege from the English. 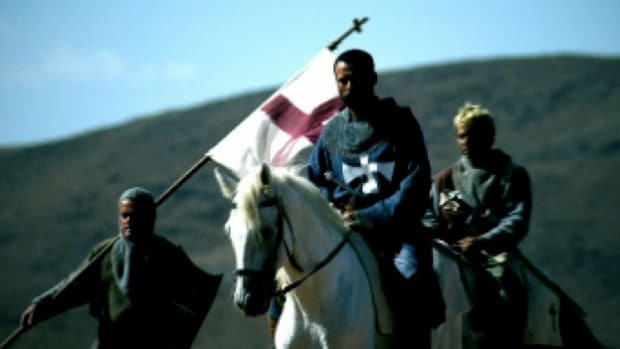 Against the advice of most of his counselors and generals, Charles granted her request, and Joan set off for Orléans in March of 1429 dressed in white armor and riding a white horse. After sending off a defiant letter to the enemy, Joan led several French assaults against them, driving the Anglo-Burgundians from their bastion and forcing their retreat across the Loire River. After such a miraculous victory, Joan’s reputation spread far and wide among French forces. 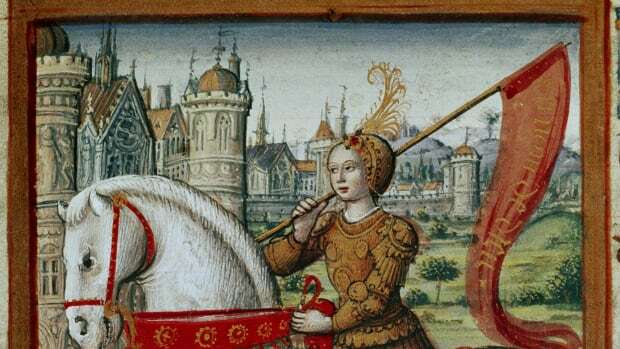 She and her followers escorted Charles across enemy territory to Reims, taking towns that resisted by force and enabling his coronation as King Charles VII in July 1429. Joan argued that the French should press their advantage with an attempt to retake Paris, but Charles wavered, even as his favorite at court, Georges de La Trémoille, warned him that Joan was becoming too powerful. 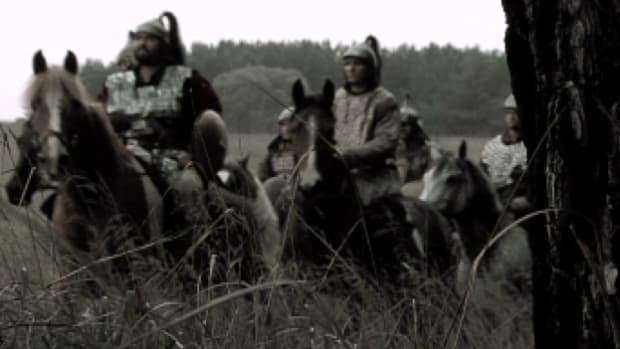 The Anglo-Burgundians were able to fortify their positions in Paris, and turned back an attack led by Joan in September. 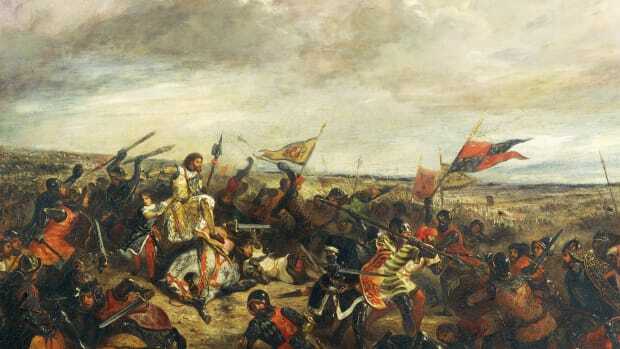 In the spring of 1430, the king ordered Joan to confront a Burgundian assault on Compiégne. In her effort to defend the town and its inhabitants, she was thrown from her horse, and was left outside the town’s gates as they closed. The Burgundians took her captive, and brought her amid much fanfare to the castle of Bouvreuil, occupied by the English commander at Rouen. In the trial that followed, Joan was ordered to answer to some 70 charges against her, including witchcraft, heresy and dressing like a man. The Anglo-Burgundians were aiming to get rid of the young leader as well as discredit Charles, who owed his coronation to her. In attempting to distance himself from an accused heretic and witch, the French king made no attempt to negotiate Joan’s release. In May 1431, after a year in captivity and under threat of death, Joan relented and signed a confession denying that she had ever received divine guidance. Several days later, however, she defied orders by again donning men’s clothes, and authorities pronounced her death sentence. On the morning of May 30, at the age of 19, Joan was taken to the old market place of Rouen and burned at the stake. Her fame only increased after her death, however, and 20 years later a new trial ordered by Charles VII cleared her name. Long before Pope Benedict XV canonized her in 1920, Joan of Arc had attained mythic stature, inspiring numerous works of art and literature over the centuries and becoming the patron saint of France. In 1909 Joan of Arc was beatified in the famous Notre Dame cathedral in Paris by Pope Pius X. A statue inside the cathedral pays tribute to her legacy. 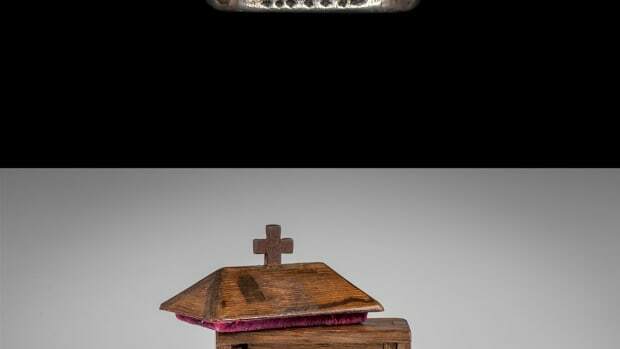 Joan of Arc Ring Back in France After 600 Years in U.K.